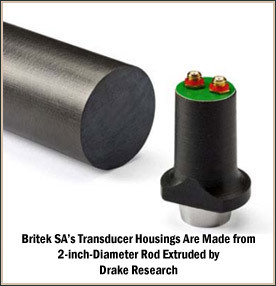 Drake Research extrudes PEEK (polyether ether ketone) producing rod and plate stock for machined seals, bearings, bushings as well as structural and electrical components. We produce Natural (non-reinforced), Bearing grade, Carbon fiber, HT and Glass fiber reinforced PEEK to meet the highest performance requirements. Our products are produced from 100% prime resin and with MIL-P-46183 certification. Drake Research PEEK manufactured stock is suitable for use where high impact, high tensile strength, high temperature, and low weight are needed in demanding chemical environments. Exceptional chemical resistance to inorganic and organic acids; bases; steam and hot water. Extrusion produces highly consistent physical properties. Drake Research only extrudes PEEK Products inquire for more information. Custom formulation & extrusion - Custom sizes to fit your parts are available and we blend customer specified ingredients on-line, email or call for quotation. Economical alternative products- Generic versions of carbon fiber, bearing grade and short glass fiber available for when Mil-P certifications are not required.